We took the twins trick-or-treating, despite the blizzard that hit last night. 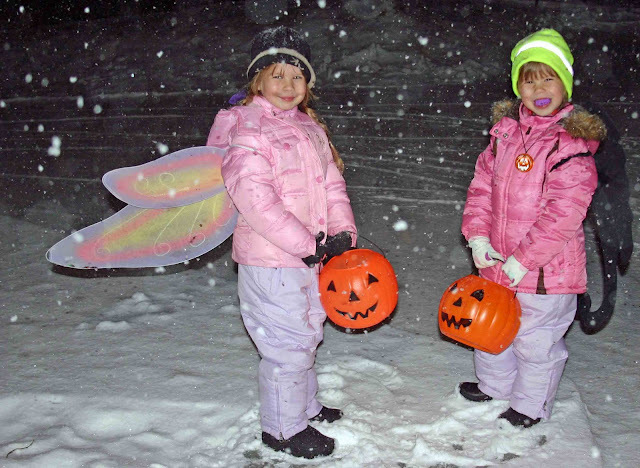 I bundled up the girls, slapped some wings on their backs, and called them costumes. I don't know what it is about my kids and crazy teeth, but one daughter insisted on wearing purple plastic fangs that she refers to as her "bat teeth." They look adorable. I remember all the cold trick or treat days back in Illinois. Here is California we can usually count on nice weather. I don't think my children ever had to wear a snowsuit to trick or treat. Makes it hard to see the costume!! "dinner last night: candy" - Seriously, if anyone with kids says they eat anything other than candy Halloween night I KNOW they're lying! I can't imagine trick-or-treating in the snow. But they sure are cute! Trick or treating in the snow must be so wild!!!! But so much fun! The girls certainly look happy!! Love that you put candy as your dinner last night!!! I love the teeth! How wonderful to get to fly in the snow!